Tosoh Bioscience has produced an application describing how to improve reproducibility of MW measurements of polypeptoids using an EcoSEC GPC system. Polypeptoids are a new class of synthetic polypeptide analogues. Because of intense hydrogen-bonding among the chains of polypeptoids, aggressive solvents such as hexafluoroisopropanol (HFIP) must be used as the mobile phase for gel permeation chromatography (GPC) analysis. Highly reproducible data, needed to detect subtle molecular weight distribution trends, were generated with an EcoSEC GPC System and TSKgel mixed-bed columns. A series of block poly-b-alkylalanoids were provided by Dr Li Jia and SEC analysis was done at Tosoh’s Tokyo Research Center in Japan. 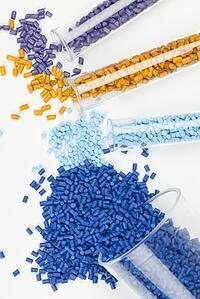 Polymers were dissolved as received in HFIP at a level of 0.5 mg/mL, and passed through a 0.5 μm membrane filter. The column set used was a series of two TSKgel GMHHR -M (4.6 mm ID x 15 cm L) columns packed in HFIP. The apparent MW data in the application note demonstrate that an HFIP mobile phase can be reliably used with the EcoSEC GPC System for determining the MWD of polypeptoids, specifically block poly-b-alkylalanoids. 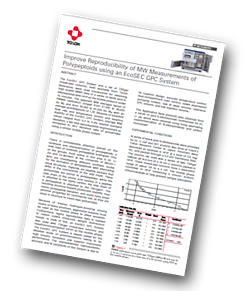 In addition, these results demonstrate that the EcoSEC GPC System has unprecedented baseline and flow-rate stability, as compared to using conventional HPLC systems for GPC analysis. Even with using HFIP, a toxic, strong solvent capable of dissolving polypeptoids, the pooled percent relative standard deviation of number- and weight-average MWs of a set of block poly-b-alkylalanoids, was 0.2 to 0.3%, surpassing the reproducibility using conventional HPLC systems used for SEC. This method is suitable for the study and characterization of these interesting polypeptide analogues and for the optimization of polymerization conditions for block poly-b-alkylalanoids. 1. L. A. Roper, D. Olson, B. Danowski and J. D. Kehlbeck, FASEB Journal, 22, 1061.8. (2008).